Last week, CRP covered the story of MEAR ONE’s controversial new mural in London, Freedom for Humanity. This week, we are sad to report that Tower Hamlets council is seriously considering erasing the new piece. Notice that, in the original story, the mural has now been labelled as “Anti-Semetic” in large letter, while MEAR’s response that the piece is about class and privilege is at least 3 times smaller. Nowhere in the conversation are class or privilege mentioned. It is not surprising that the plutocracy wants to obscure the issues that MEAR is raising with the subjective “determination” that the piece is anti-Semitic. After all, the same politicians and the banker employers are responsible for the inequities that MEAR is calling out. In some ways this piece is too powerful for them to let exist. Below the “official article” is a well crafted response from the International Business Times. An artist paints a work depicting what he sees as the truth of underlying events that are bringing about mass inequality, death and destruction. According to some, it is hugely offensive, should never have been seen in public and the artist responsible should be imprisoned. As always, politicians get involved and when it is seen in public, the artist receives a threat to his life. The decent thing to do would be to ban the work, hide it away or maybe paint over it to avoid offending sensitivities. Congratulations, you’ve just denied the world being able to see Picasso’s ‘Guernica’. Now I’m not for one moment suggesting the latest work to stir controversy,Mear One’s ‘Freedom for Humanity’ painted in the East End of London is comparable to Picasso in its content, message or delivery. But they are in similar vein. You don’t have to like it and you can be vehemently opposed to it. But when you have people suddenly claiming it incites racial hatred, it’s time to take a step back and, no pun intended, get some perspective. I’ve intentionally used that example in a hyperbolic way to counter to some of the odd assertions that have been levelled at the work. The fact I have to explain that is doubly depressing but when you read the following I hope you’ll understand why. That’s pretty close to some doublethink. Freedom of expression is good, except regardless of artistic intention, if it may offend local residents and then it’s bad and should be stopped. Now if this mural was badly created or indeed hugely offensive I’d be on the side of those complaining. But what does this work actually show – where is Mr Rahman’s “anti-semitic propaganda”? 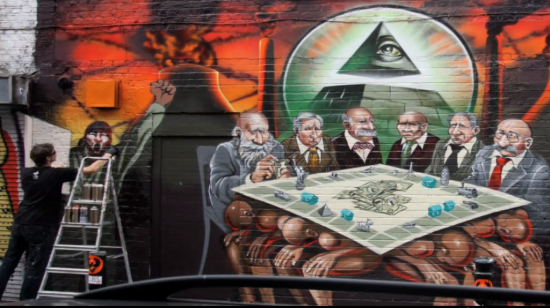 It depicts a group of businessmen and/or bankers sitting around a board game. Indeed the artist himself has said as much in his defence. So why is this mural so offensive to the local community that Mr Rahman is asking for it to be removed? Because it reveals that the global financial system is run by white, middle aged men, some of whom are also Jewish? I really hate to break it to Mr Rahman but if he travelled a few miles down the road to the City of London and went and sat in the boardrooms of the major banks I think he’d be in for a shock. But then sometimes reality can be a painful thing, holding a mirror up to the world and revealing what many of us may know to true but just as many choose to ignore. But this always been at the core of street art and is one of its major attractions and has been used to highlight numerous causes, from global inequality through to anti-whaling campaigns. Its power is the fact it’s not hanging in a gallery or part of a recognised ‘system’, it’s on a wall that you or I could walk past and observe. Its power is also that it cannot really be controlled by local authorities, despite their best attempts. Much of what has driven the rise of Obey, ironically now a commercial entity in its own right, came from John Carpenter’s brilliant satire ‘They Live’ where the main character can see the reality behind everyday life. Then there are artists, such as Blu in Italy, using large-scale works to highlight the hypocrisy of religion and the state. But that power is also why it also generates such debate. Speaking to artists, you find that many are what you might loosely term as ‘left wing’ and use their medium as a way of expressing their frustrations with the world as they see it. Many of them are aware that they can project powerful images and messages to the public but they are also acutely aware that there is a boundary between artistic freedom of expression and its potential to offend. So should something that could potentially cause offence be seen so openly in public? Of course it should. And this is the crux of the issue. The best political art, or indeed political anything – books, songs, magazine articles – should provoke critical thought, informed debate and hopefully draw attention to an issue. They shouldn’t be withdrawn just because they might or could cause offence. The mural will likely be painted over, either by the Council (a fine use of public resources during a recession), or given its location I imagine another artist/writer will come along in a few weeks and will continue the natural evolution of street regardless. Geoff Whitehouse is a contributor to London-based street art magazine Very Nearly Almost (VNA). VNA is a UK-based independent quarterly magazine that documents the street art and graffiti scene, tracking everything from the wheatpastes, paint and stencils out there on the streets through to gallery shows and events that bring together artists from around the world.